19.4h x 14.4 cm diam. Signed and dated at base, brown underglaze "E. Finlay 1913". Project 24: Cicadas and gumnuts - the Society of Arts and Crafts 1906-1935 , Sydney, 1978. cat.no. 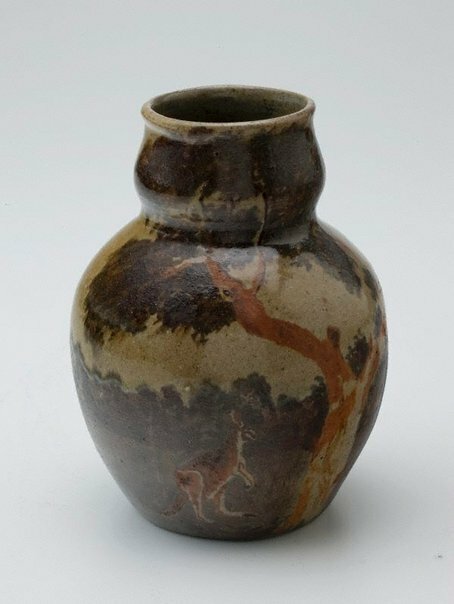 43; titled 'Vase'; Collection of Mr Nairne Butchart, Melbourne. Unknown, The potteries of Brunswick , 'Doutta Galla Pottery 1908-1913', pg. 88-94, Shepparton, 2000, 88 (colour illus. ).